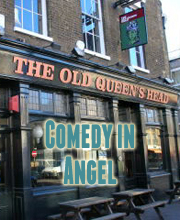 Laugh Out London comedy club is back in Tooting for a comedy night headlined by James Acaster. Star of his own 4 part Netflix series, Taskmaster, Mock the Week and Sold Out West End runs. Up and coming stand-up who has already appeared in several competition finals including the BBC Comedy Award and Funny Women. The Mash Report, Comedy Central’s Roast Battle & Frankie Boyle’s New World Order. One of the loveliest and most charming MC’s around.